The Yamaha CSVR clarinets are the result of years of development dedicated to a clearly focused concept: crafting a Custom clarinet that has a beautiful sound, consistent quality, and an affordable price. 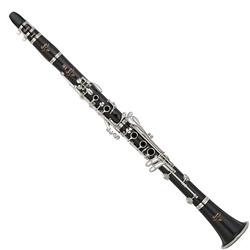 Both student and professional clarinetists require a rich sound and comfortable playability. Combined with Yamaha's high standards for quality and consistency, these new CSVR clarinets are exceptional instruments, ideal for clarinet students and also professional performers and educators. Thick silver plating gives the CSVR a dark and resonant sound quality. Durable leather pads ensure a precise seal between pad and tone hole with the additional benefit of giving players a buzz-free playing experience. The traditional barrel shape of the CSVR enhances the playing experience giving players a well-balanced response, and perfect resistance. The elegant new ‘R’ logo on the barrel emphasizes this beautifully refined instrument. The C#/G# key of the CSVR is 2mm longer to provide comfortable and ergonomic hand placement. With its beautiful tone, rich expressive qualities throughout the dynamic range, and exceptional presence, the CSVR sets new standards in professional clarinet craftsmanship.